A blog of life-reviews by an old guy who still gets a kick out of life. I titled this post after a Harry Golden column, in his Carolina Israelite. He included it in Chapter 6, “Tammany, Tammany,” from his book Only in America. Unfortunately, in Harry’s delightfully retro format – an old-timey newspaper or newsletter – he couldn’t use the full-color pictures, flashy graphics and built-in links that we can use in today’s blogs. So, this bit of a book review will be more than a bit of an update. Briefly, the column dealt with the English Civil War, the execution of King Charles I, the Puritan Regime under Oliver Cromwell, and the Restoration of Charles II, as described below. Briefly, after the Restoration of Charles II, there was a bit of turnabout is fair play. That was Harry’s take on the Restoration of Charles II and the era of free love that followed. That execution came near the end of the English Civil War. (At right, actually a series of three civil wars.) 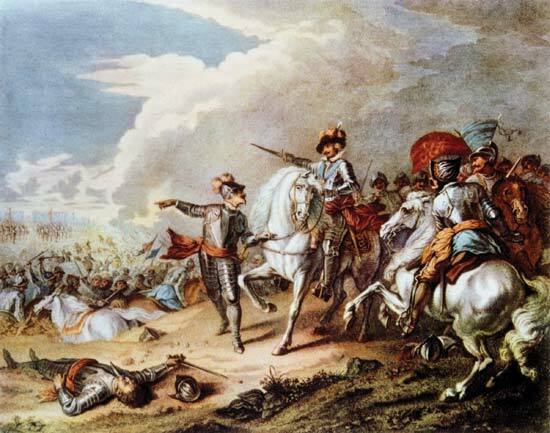 And after the Puritans executed Charles I, his son – Charles II – was forced into exile. Then the English monarchy was replaced with the Commonwealth of England, from 1649–53. And here’s how one English history-writer described everyday life under the Puritans. Soldiers were sent round London on Christmas Day before dinnertime to enter private houses without warrants and seize meat cooking in all kitchens and ovens. Everywhere was spying and prying. One may easily see how desire for office or promotion led to hypocrisy. If sour looks, upturned eyes, nasal twang, speech garnished with Old Testament texts, were means to favor, there were others who could assume them besides those naturally afflicted with such habits. Nature, affronted, reclaimed her rights with usury. The [Puritans] had punished adultery with death; Charles scourged faithfulness and chastity with ridicule… It was with relief that the public learned that the King had taken a mistress from the people, the transcendently beautiful and good-natured Nell Gwynn, who was lustily cheered in the streets as “the Protestant Whore…” The King’s example spread its demoralisation far and wide, and the sense of relief from the tyranny of the Puritans spurred forward every amorous adventure. Which cycle are we in now?? 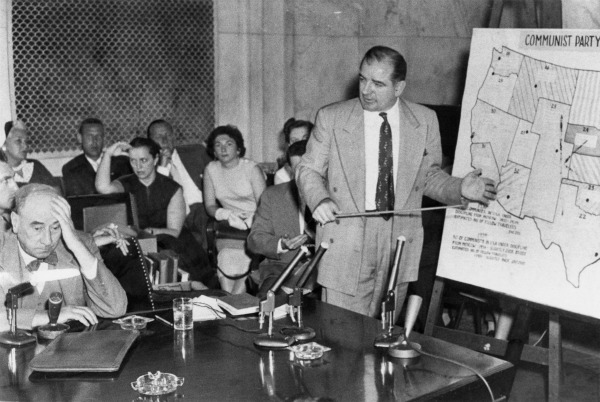 The lower image is courtesy of McCarthyism – Wikipedia, the free encyclopedia. Until this moment, Senator, I think I have never really gauged your cruelty or your recklessness. Fred Fisher is a young man who … came into my firm and is starting what looks to be a brilliant career with us. Little did I dream you could be so reckless and so cruel as to do an injury to that lad… [At this point, McCarthy tried to renew his attack, but Welch interrupted him:] Senator, may we not drop this? We know he belonged to the Lawyers Guild. Let us not assassinate this lad further, Senator. You’ve done enough. Have you no sense of decency, sir? At long last, have you left no sense of decency? The full column by Harry Golden – “When adultery was proof of ‘loyalty'” – can be found at pages 210-11, of the 1959 Permabook edition of Only in America. The quotes from the “English history writer” are from Volume 2 of Winston Churchill’s A History of the English–Speaking Peoples. Volume 2 was titled, “The New World.” The quoted material is from pages 240-41 and 264 of the Bantam Books edition, published in 1968. Re: history repeating in cycles. See Historic recurrence – Wikipedia, the free encyclopedia. This entry was posted in Book reviews on March 29, 2015 by bbj1969per@aol.com. Didn’t we try this “Wall” thing before?